Essentials uses only Global Organic Latex Standard (GOLS) Certified Latex and Global Organic Certified GOTS Certified Cotton and Wool in production of this exceptional mattress. Essentials is available in Extra Firm - Plush firmness levels. The wider comfort range makes this mattress a great choice for side, back and stomach sleepers. Multi zippered construction provides for easy assembly and customization. Essentials has a clean, tailored, European style appearance. Structurally, it's built for comfort, support and durability. All natural certified organic materials make up the construction of this exceptional mattress. Wool is not only a great heat regulator,it acts as a natural flame barrier. It has the unique quality to char but not burn. Wool meets Federal fire safety standards; without the use of dangerous chemicals. Naturepedic's wool is GOTS Certified. Basically, PLA's are plant based materials. Made from non-GMO plant starch. PLA is buoyant and breathable. Best of all it is safe. PLA's are often used in food packaging because they have no off gassing issues. 3" of GOLS Certified organic Latex offers outstanding pressure relief and conformity. Unlike synthetic foams, Organic Latex has no off gassing. It sleeps cooler and has more bounce than Memory foam. Expect Organic Latex comfort foam to offer a little more bounce and resiliency than memory foam. You'll lay more on top and less in the mattress than most synthetic materials. The combination of individually wrapped coils and organic latex limits motion transfer and sleeps cool. The Essentials offers 5 different comfort options. Choose feels ranging from Extra Firm to Plush. Extra Firm: There is a very small percentage of people who just can't get their mattress hard enough. They are typically back and stomach sleepers who genuinely enjoy this type of rigid support. We can't stress enough how rare it is that someone truly feels most comfortable on the firmest of beds. Often times, people mistakenly equate firmness with support; they are not synonymous. A mattress can be supportive and still have enough pressure relief for comfort. Firm: This mattress is typically best suited for back and stomach sleepers. Not quite as rigid as the Extra Firm but still quite firm. Luxury Firm: This is the safest bet for most individuals seeking a firmer feel. Just enough softness to accommodate the curvature of the spine while on your back. On your stomach it gives pressure relief but does not allow your lower back to dip and cause lumbar pain. The luxury firm may be soft enough for some side sleepers but most will find their sweet spot in a softer bed. Medium: The medium will be the choice of a large portion side sleepers and some back sleepers who prefer a bit more softness. Here is where body type comes into play. A heavier person will tend to sink further into the mattress. This tends to make the bed feel softer than a lighter individual who will lay more on top of the mattress. Plush: The Plush is ideal for the side sleeper who wants the utmost in pressure relief and conformity. Some (not all) back sleepers will appreciate this level of softness. The Plush will will be too soft for most stomach sleepers. Although Essentials is priced higher than many online mattress companies, It's a great value for the quality you receive. Compared to other Organic Luxury beds, Essentials is a great buy. If your budget dictates you spend under $1,000, this mattress is not for you. However, if you are looking for a quality luxury organic mattress, Naturepedic's Essentials is well worth considering. For the first 90 days you may swap out any 3" comfort layer. Your only responsibility is the shipping cost. After 90 days, you are still able to purchase additional layers if you wish to change the support or comfort of your mattress. This is a much less expensive option than replacing your entire mattress. Essentials has a 90 day money back guarantee is offered if purchased direct from Naturepedic. Between 60 - 90 days, you may return your mattress for it's original price less all shipping charges. For purchases made from a retailer, you will have to refer to their terms and conditions. Essentials takes the next step in luxury and comfort customization. This Certified Organic mattress is made from the finest natural materials. It's an ideal choice for most allergy sufferers. No chemical fire retardants, dangerous polyurethanes or pesticides are used. The Essentials mattress offers 5 distinct comfort feels. This makes it easy to find that just right level of comfort and support. This is a huge competitive advantage over one comfort fits all mattress companies. Backed by a long standing reputation for quality and customer support, Naturepedic's Essentials is a winner. Certified Organic Cotton has a soft hand and is exceptionally breathable. I'ts also extremely durable and sleeps cool. Certified Organic Latex has more bounce and resilience than synthetic materials like memory foam. Natural latex also limits motion transference; a great benefit for couples. Certified Organic Wool regulates heat and keeps you cool and comfortable. It also acts as a natural fire barrier. No chemical flame retardants are used. 8" individually wrapped coils offer great support and limit motion detection. No Off Gassing: The natural materials in the Naturepedic Essentials may initially give off a mild scent. It has been described as sweet or musty depending on your perception. This scent is non toxic and dissipates quickly. Naturepedic beds are GreenGuard Certified to not emit any toxic chemicals into the air. 5 comfort feels: Choose from extra firm to plush. That just right feel for everyone! Latex Allergies: Even though Latex is a contact allergy and should not pose a danger. We recommend playing it safe and choosing another option if a confirmed allergy exists. Price: The Essentials mattress costs more than most online mattresses. It should be noted, however, that this is a premium organic mattress that is priced well below comparable products of similar specifications. Is Essentials right for you? 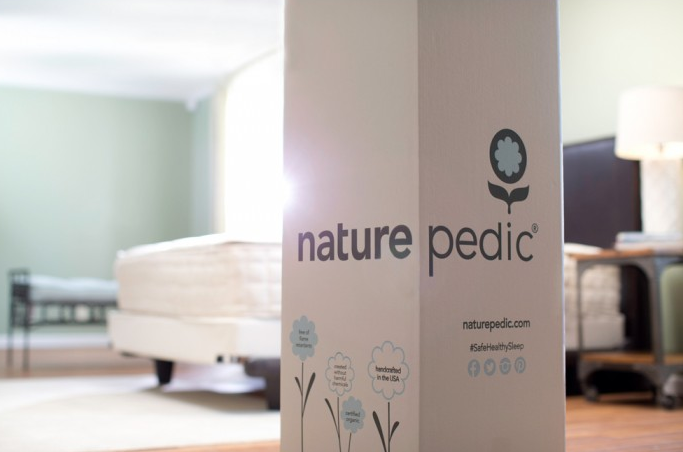 The Essentials by Naturepedic is a luxury Certified Organic mattress that's priced right!